I think you know my preference on that one! Last edited by Shaun; 22 April 2012 at 12:32 PM. -Not too much wiring / amps involved / added weight! -On a budget as most of my modding budget is spent on performance etc! Pioneer DEH 4400BT - which has Parrot bluetooth built in and USB connectivity. Got for £130 but can be had on the net for approx £110. All came to £34 delivered! 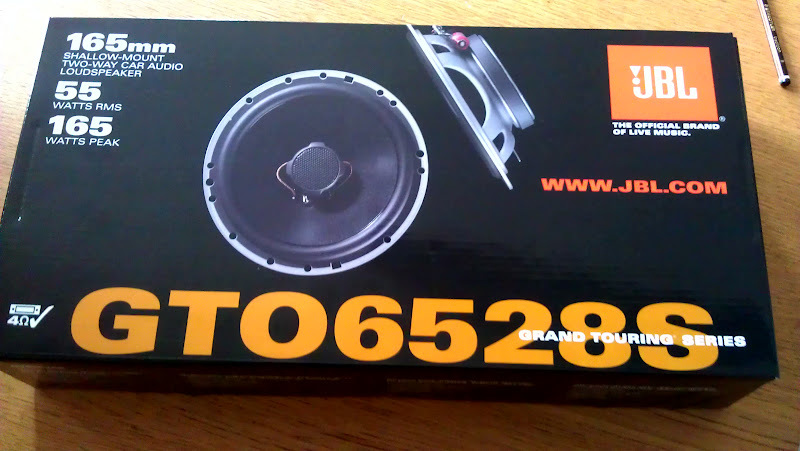 Got them direct from JBL online for £39.99 delivered. Fiitted double din to single din cage bits and din pocket. Also fitted the bluetooth mic in the top right of the single din pocket. 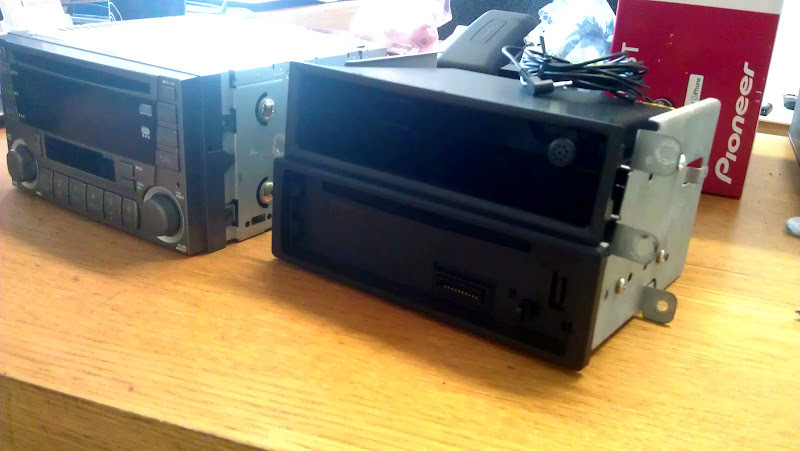 Got it all fitted and working, even managed to load phonebook onto headunit via bluetooth. Got this for £10 from Maplins and is absoloutely tiny in size, no more than a few cm's. Should hold several hundred songs on there to stream from USB. The Corsa spacers I ordered were not the right ones. But a bit of modifying sorted them out. Applied minimal Dynamat in a small area around speaker. Really good sound quality, especially clear and crisp treble. I tried them as 4 Ohm but these are designed as 2 Ohm speakers and they were quite a bit louder running at 2 Ohm, which is how I left it. Last edited by rickya; 17 May 2012 at 06:59 PM. Real men don't have ICE- it weighs too much. The std stereo weighed about 5kg so I've saved weight plus I suffer from IBS anyway so that brings it all down to Spec C weight! Real men have real power and then don't give a **** about the extra weight from the ICE set-up! You need to dynamat the whole door chap.... not just round the speaker!! Do it once and do it right. Your right, the dam thing still vibrates!! 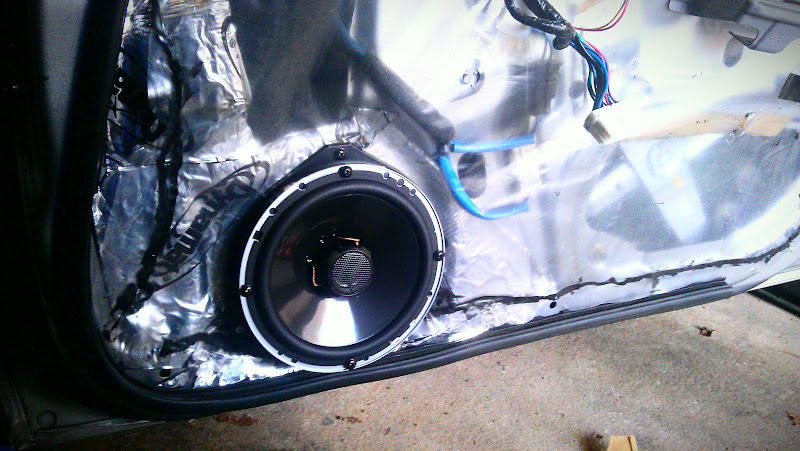 this is what i had to do on my blob sti doors, then get proper spacers and larger speakers. MOT the other day, all was fine but that clicking noise from nearside rear turned out to be the wheel bearing. So with that advisory in mind, I went ahead and ordered a few more bits from Apex Performance / Hardrace.com USA. To fit all next week hopefully. Last edited by rickya; 05 July 2012 at 02:03 PM. What parts are those Ricky?? Last edited by rickya; 26 June 2012 at 01:29 PM. Cool. What you hoping to gain by fitting these mate? My old engine mounts are shafted so these are a good upgrade and probably cheaper than OEM. In the kit you get the uprated gearbox mount, which I didnt necessarily need, but will do it anyway. While your doing the gearbox mount you might as well do the Shifter Bush Kit as well I thought! I think with these bits you will lose some comfort etc but the uprated engine mounts will cause less engine movement / roll under braking and hard cornering. The Shifter kit and gearbox mount should help with a crisper / more precise gear change though I would imagine a bit harder when changing gear. The car is going to be kept for the foreseeable future, and is only going to be used about twice a week. I think Iv driven it 4 times in the last 2 months! The amount of money Iv chucked in and how rubbish the used car market is for these type of cars, means there's no point getting rid of! The plan is to slowly uprate bits, but now with a mind to a more track focused car rather than an everyday car which is what I originally bought it for. So there will be little compromise for comfort when it comes to changing suspension bits and fitting / setting up my recently acquired Tein Monoflex Winding Master Coilovers! And in the future, fit bits like: gauges, oil cooler with oil filter re-location, battery relocation and later a disc upgrade to Performance Friction 2 piece discs and PF01 pads. Last edited by rickya; 26 June 2012 at 02:41 PM. Mate you should join me and budgie at Bedford then!!! I've been looking at battery relocation kits and they are quite pricey hbut something I'm considering too. If you see any bargain kits let me know but when I get a bit more time I'm going to price up the various bits individually to see what I can do. Brakes wise, I'm going to fit some dBA drilled rear discs with PF01's for track use but in the interim get some lesser spec PF pads for every day use as they take to long to get heat in. Very true with the PF pads, the 01's will take time to heat up, the Z pads don't. DBA slotted discs as they like to call them, are very good discs. I want to relocate the battery to the boot as that is where I am thinking of puting the oil filter/cooler relocation kit and eventually the existing oil catch can. Didn't realise they were expensive though! Would love to, but won't have the suspension done by then I think. Yeah I forgot the Ricky factor where he needs more time and money to put the damage he did right. About the pads,we are running PF Z-rated pads and think they're great,but still they need little bit more heat put on them,but if we are comparing them to the DS2500,think Z-rated pads are much better like from cold and on track we will try them in coming months.